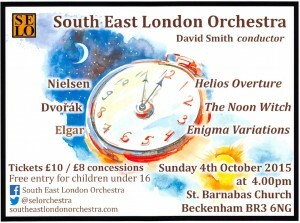 We look forward to welcoming back the South East London Orchestra for their next concert in St. Barnabas. The programme is to include works by Nielsen – Helios Overture, Elgar – Enigma Variations and Dvorak – The Noon Witch. Dvorak’s ‘The Noon Witch’ is rarely heard as often as perhaps it should be. A symphonic poem (lasting 13 minutes or so) written in 1896 for a performance at the Prague Conservatoire, its first full public performance was given in London under the baton of Henry Wood. The oboe and bass clarinet depict the characters of a misbehaving child and witch, respectively. Find the full story revealed in this concert! Tickets are £10 and £8 for concessions, available in advance online, via the following link (entry for children under 16 is free): http://www.eventbrite.com/e/south-east-london-orchestra-concert-tickets-18378269900. Tickets will also be available on the door, as usual, at prices as above. Details of the new SELO Friends membership scheme can be found here.